From the platform of Lalu Prasad's grand anti-BJP rally in Patna today, Sharad Yadav today promised a pan-India Grand Alliance that would take on the BJP at the next general election. 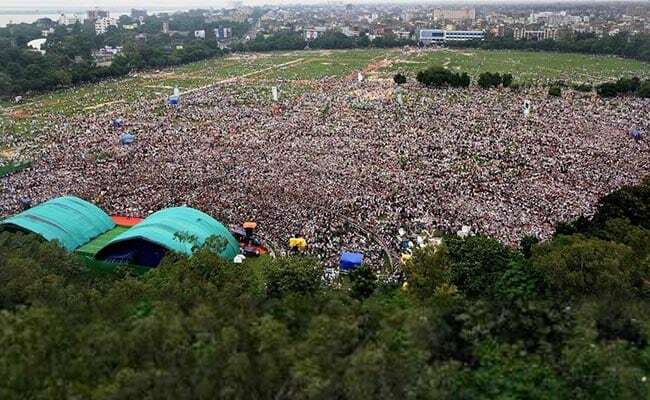 But the promised mega-platform of the opposition at Patna's Gandhi Maidan had shrunk, with some of the key opposition leaders, including Congress's Sonia Gandhi, Rahul Gandhi and Dalit powerhouse Mayawati giving it a miss. Sharad Yadav shared stage today with Lalu Yadav, Bengal Chief Minister Mamata Banerjee and Samajwadi Party leader Akhilesh Yadav. The leader, who is staring at an expulsion from the JD(U) for defying orders to skip the rally, was greeted warmly by Lalu Yadav with an embrace on the dais. "I say here today a gathbandhan will be made in entire India," Sharad Yadav said, addressing the crowds at the "Desh Bachao, BJP Bhagao" rally. "Here on this stage, the maha gathbandhan was made. Attempts were made for a coalition in Delhi, it was unsuccessful. But it was successful here." Earlier this month, Sharad Yadav was removed as the leader of Janata Dal (United) in Rajya Sabha after his open disapproval of Nitish Kumar's alliance with the BJP. Lalu Yadav, took spoke against his former ally, who junked the Grand Alliance last month to join hands with old ally BJP. "I knew Nitish was not the right person, but the situation was such that I had to do it (enter the Grand Alliance) keeping in mind the state of affairs in the country," he said. "I never agreed to Nitish being the Chief Minister." Last week, Rahul Gandhi left for the Norwegian capital Oslo on a trip to meet political and business leaders. Mayawati said she would not attend since the history of such experiments has not been heartening and accused other parties of "back-stabbing" the BSP. The Congress was represented by Leader of Opposition in the Rajya Sabha Ghulam Nabi Azad and party general secretary C P Joshi. Before coming to attend the rally, Sharad Yadav told the media that he was with the Grand Alliance and his faction was the real JD(U). "Let's wait for one or two months. I will publicly prove it that the JD-U is our party," he said.